Many Californians might be confused about 1095 forms and how they are to be used for filing their 2015 taxes. Californians who applied for health insurance through Covered California or Federal Market Exchange in 2015 should have received, at the beginning of February, a 1095- A form. This is a Health Insurance Medical Statement. In Section 1, it lists the health insurance policy name, the health insurance that you were signed up with a start & end date of coverage. Section 2 list the individuals who were covered in the health plan. In Section 3, it lists the month the premium was paid for, the subsidy California paid, and the total amount the insurance company received. You should handle the 1095-A like a W-2 form or 1099, and give it to the person who is preparing your taxes. Your tax preparer/accountant will use the 1095-A form, to fill out the IRS form 8962 (which lists the premium tax credit). It will then be determined if you will receive a tax credit or if you will have to pay part of the money back that you received in the form of the subsidy, as your income is higher than you original projected. If you enrolled in a health plan through the Market exchange, you generally must file an individual tax return and submit a Form 8962 to claim the premium tax credit, even if no advance payments of the premium tax credit were made for your coverage. By not filing a tax return , the most likely result will bethat subsidies payments towards the health insurance premium will be canceled. Please contact your accountant for more details regarding 1095- A and 8962 tax forms, and also read this informative IRS information sheet. Should you have not received your 1095-A form, you can log onto your account in Covered California to download your 1095-A form , or contact Covered California at 800-300-1506 or your agent who assisted you with the process of applying for health insurance over the exchange. For people who have obtained health insurance outside the exchange or enrolled in an employer health plan will receive a 1095-B or 1095-C form (employers with over 50 employees), which serves as a proof of carrying health insurance. This is a Health Insurance Medical Statement. In Section 1, it lists the Responsible Individual’s personal information; Section 2 and 3 list the employer and/or issuer of the coverage; Section 4 lists the individual and family member(s), indicating each month enrolled. The tax form 1095-B and 1095-C should be treated as a tax document, but do not need to be filled with your taxes. The 1095 form serves as proof for carrying health insurance with the minimum essential coverage, for each month of the year, thereby avoiding the risk of paying tax penalties for not carrying health insurance. You might receive several 1095 forms, as you might have had health insurance coverage through the exchange (1095-A) and switched than to an employer insurance or individual insurance 1095 B/-C ), or switched from one insurance carrier to another insurance carrier . Keep all of your different 1095 tax documents with your tax records. If you are missing a 1095-B form contact your insurance carrier to resent you the 1095-B form. 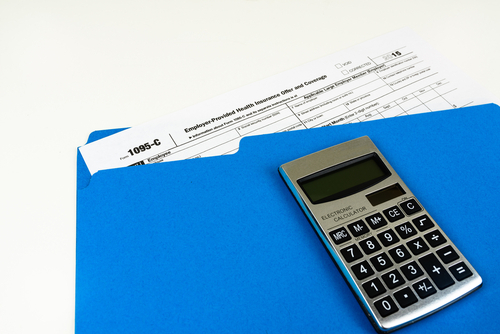 If you miss a 1095-C form contact your employer to resent your 1095-C tax forms. Agents cannot obtain a 1095-B or C form for you. Due to the fact that the deadline for issuing the 1095-B (provided by the health insurance carrier ) or the 1095-C (provided by large employers with over 50 employees) was extended from January 31st to March 31st, many Californians might not yet have received their 1095-B or 1095-C form in time for filing their 2015 taxes April 15th. Do not delay to file your taxes ,if you have not received your 1095-B or -C form. Like last year, you will check on your tax return that you carried minimum essential coverage throughout the year. In case you or any of your family members did not have coverage for the entire year, a coverage exemption may apply for the months without coverage. If one or more family members did not have minimum essential -coverage or the exemption does not apply, you may have to make an individual shared responsibility payment. The information of the 1095-B or -C forms will help your tax preparer /accountant to complete the IRS tax from 8965. The IRS points out that you should not enclose forms 1095-A , 1095 -B or 1095-C with your tax return . As per the IRS . “Although you may use the information on the forms to help complete your tax return, these forms should not be attached to your return or sent to the IRS. The issuers of the forms are requited to sent the information to the IRS separately. You should keep the forms for your records with your other important tax documents”. Please contact your accountant for more details regarding the forms 1095-A &8962 form and 1095- B,-C and 8965 tax forms and also read this informative IRS information sheet.